A teenager from Kazakhstan has been placed into a detention centre after a man was stabbed in the head. 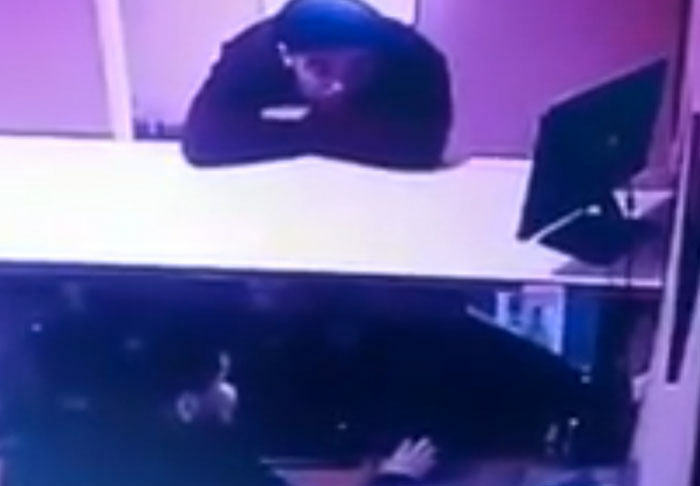 The entire encounter was captured on CCTV and shows one man reach over the desk at an estate agency and stab a seated man in the top of his head. Incredibly the victim of the stabbing seems to barely bat an eyelid. He looks up, slowly wheels his chair backwards, before finally venturing a hand to his crown and feeling the blade. According to LiveLeak, local media reports say the men were acquaintances, and that the knife was lodged one centimetre deep into the victims skull. That doesn’t sound a lot, but when you consider how lean the top of your head is…ouch. The 19-year-old who committed the stabbing, a resident of Petropavlovsk, stands accused of inflicting grievous bodily harm. Check out the bizarre scenes. How is he not freaking out just a little bit?